The Iran lobby, especially the National Iranian American Council, have been busy hurling attacks and invectives at John Bolton, President Donald Trump’s nominee to be the new national security advisor, calling him everything from being crazy to a war monger to an extremist or child of Satan. The accusations have seemed to take on a life of their own as Iranian regime loyalists such as NIAC’s Trita Parsi empty out the thesaurus in an effort to try and find something that will stick and either derail his nomination or throw cold water on the administration’s plans to revisit the Iran nuclear deal. In either case, it seems apparent the trains have already left the stations and on Capitol Hill, it appears Democrats are only pondering going after President Trump’s CIA director nominee, Gina Haspel, for past involvement in the interrogation of terror suspects, with Bolton and secretary of state nominee, Mike Pompeo, looking like solid confirmations. This new troika of national security, intelligence and diplomatic heads represents a significant shift in the president’s thinking as it relates to the challenges of Iran, North Korea and Islamic extremist terrorism. Far from trying to swat individual terror suspects like so many mosquitos, it appears the administration maybe looking for a more strategic approach in draining the swamp so-to-speak by dealing directly with the sources of terrorism; more specifically nation states. The terror attacks of 9/11 served as a reminder that safe harbors such as a Taliban-controlled Afghanistan, provide training, security, funding and logistical support for terrorists to plan and execute their attacks. The rise of ISIS out of the wreckage of a Syrian civil war and Iraqi sectarian conflict borne out of Iranian regime’s meddling carved out a caliphate which provided ISIS with everything from oil to sell and ready recruits to satellite broadcasts and a news magazine. The Iranian regime set the template when it built Hezbollah to a formidable terrorist operation and shock troops for proxy wars. Iran mullahs utilized Hezbollah and a safe harbor in Lebanon. But now the mullahs in Tehran are confronted with a rapid flurry of problems that have escalated nearly out of their normally iron-fisted control. Massive protests swept the nation as the combination of punishing economic conditions and dissatisfaction with oppressive rule, including morality laws specifically targeting Iranian women, drove ordinary Iranians to extraordinary acts of defiance unheard of in Iran. This included women launch the hijab movement with the mullahs responding by passing laws criminalizing it on the basis it promoted “prostitution” and calling for 10 years imprisonment. These trends are unmistakable and more importantly, unassailable by the Iran lobby, which for the most part has stayed silent on these domestic protests; choosing only to blame the economic conditions on the U.S. not fully complying with the terms of the nuclear deal. Apparently Parsi and his friends think we should empty out Ft. Knox on behalf of the mullahs. What is apparent though is that the accusations being flung by the Iran lobby at Bolton’s nomination miss an inescapable truth which is Bolton is not setting the stage for war when Tehran has already been at war with the West ever since it supplied explosives to kill Marines in Beirut or U.S. troops in Iraq. Ivan Sascha Sheehan, incoming executive director of the School of Public and International Affairs at the University of Baltimore, makes that point in a strongly worded editorial in The Hill. 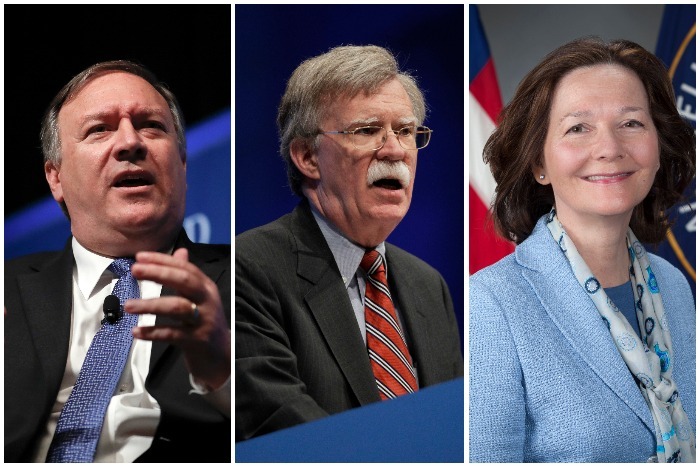 “Those who are concerned about the potential for war with Iran should embrace Bolton’s appointment and support the administration’s efforts to confront Tehran’s destabilizing regional influence by taking its theocratic regime to task. The regime’s misbehavior only worsened in the run-up to Trump’s ascension to the Oval Office, and particularly under the prior administration’s cooperative policies that engendered an even greater sense of impunity than the Islamic Republic was used to,” Sheehan writes. “Trump’s assertiveness during his first year in office is paying small dividends. U.S. Navy officials recently reported that close encounters between their vessels and those of the Iranian Revolutionary Guard Corps (IRGC), which were commonplace over the previous two years, halted abruptly in August,” he added. But what the Iran lobby is most fearful of is not a simple knee-jerk tearing up of the nuclear deal by President Trump, but rather a consensus among U.S. allies to rework the deal, toughening provisions on terror support, ballistic missile development and human rights improvement, in an effort to save it. Using the deal as a leverage against the Iranian regime is fair turnabout since the regime and Iran lobby have used its continued existence as a blunt instrument against any calls to rein in the regime’s excesses. The Economist outlined some of the intense deal-making going on now from Great Britain, France and Germany to compel the Iranians to accept new restrictions; restrictions that should have been included in the original deal in the first place. “Sir Simon Gass, a former British ambassador to Tehran who led the British team negotiating the deal, says that it might be possible to get an agreement from Iran not to develop an intercontinental-range ballistic missile (ICBM) capable of hitting America. An ICBM, he points out, only makes sense if it carries a nuclear warhead, so testing one should prompt broad economic sanctions. Patricia Lewis of Chatham House, another London think-tank, believes that the Europeans may already be talking to the Iranians about a future regional missile-deal that would ban long- and intermediate-range nuclear missiles,” the Economist editorial said. Ultimately the real rub for Parsi and his fellow travelers is that new restrictions, coupled with worsening economic conditions will once again rollback Tehran back to 2009 when massive street protests nearly toppled the regime. As the president’s new team take their place, it’s clear the era of appeasing the mullahs is dead.